1. Add salt and pepper on drumstick chicken, and per boil vermicelli. 2. Put water and chicken in donabe, and heat with the lid on. 3. 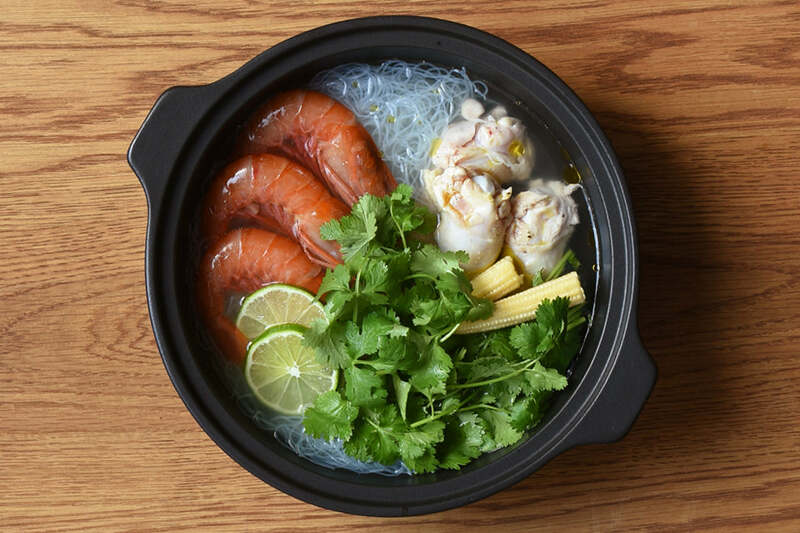 After chicken are cooked, add vermicelli, prawns, and baby corns, then boil 1-2 minutes. 4. Adjust the taste with fish sauce, salt, and paper. Garnished with coriander and lime. 1. Cut watercress into bite-size lengths and cut lemon into half circle slices. 2. 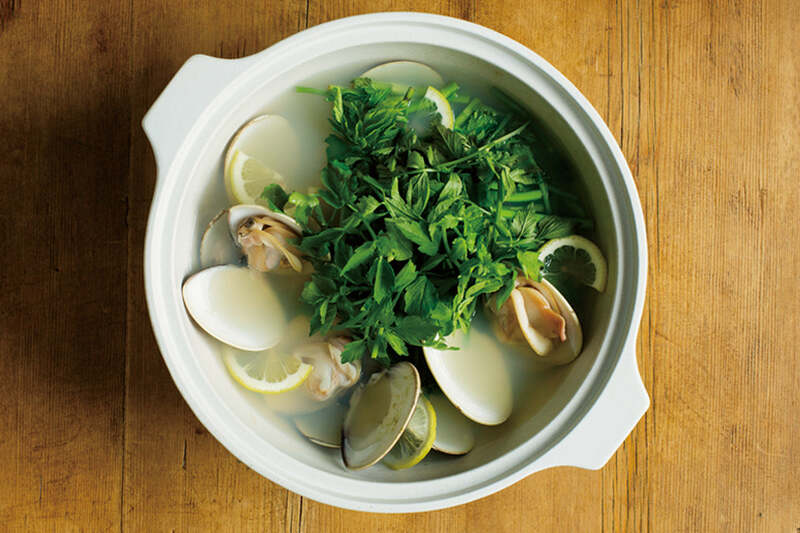 Put water, sake (or cooking wine) and clams in donabe and heat. 3. Skim off scum after clams open. Add watercress and lemon and bring to boil. 4. Adjust the taste with salt and pepper. 1. Put water, sake (or cooking wine) and garlic in donabe and heat. 2. 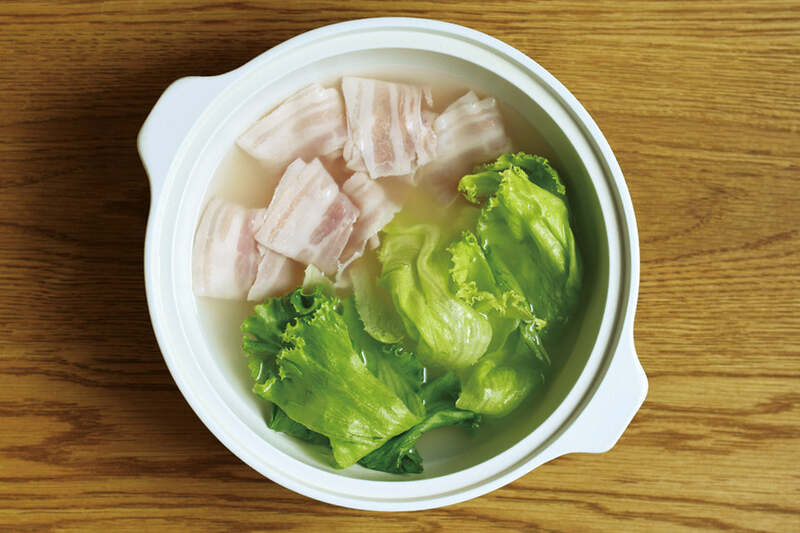 Bring to boil, dip lettuce and pork until cooked and eat with preferred dipping sauce. 3. As 'shime (finish of the meal)', add salt to the soup and cook ramen noodles. Add chopped myoga, onions and black pepper. 1. 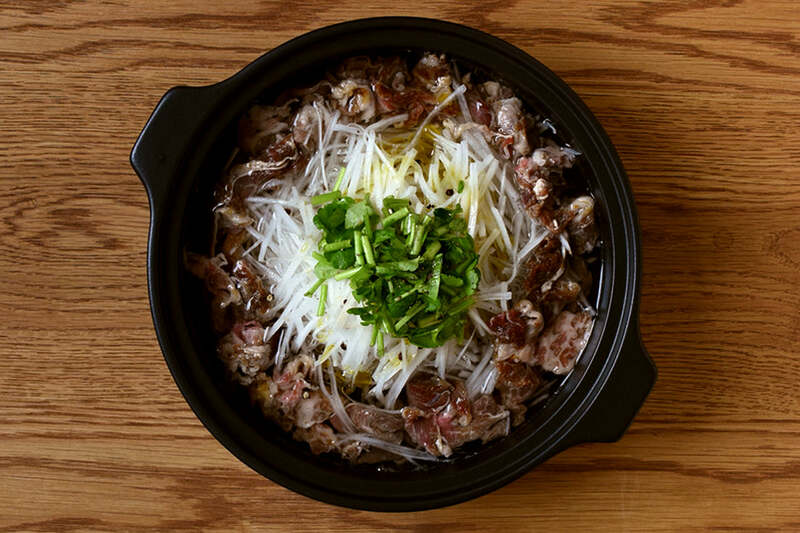 Mix all ingredients well.Add soup from the donabe to suit your taste. 1. Add sake and 3-4 pieces of crushed umeboshi in saucepan and put on medium heat. 2. Bring to boil, add bonito flakes, turn heat to low and boil with no lid until the content is 2/3 to half the amount. 3. Turn off heat and let it cool. 4. Filter with cloth and put in a preserving container. 5. For dipping sauce for one person, add ume syrup, soy sauce and 1 crushed umeboshi to 40ml of boiled down sake from steps 1-4. 1. Julienne daikon radish into 10cm long strips, marinate beef with grated garlic and soy sauce for about 20 minutes. Mince parsley. 2. Put water in nabe and bring to boil. Add daikon radish. When daikon radish turns clear add beef with marinade sauce. 3. Skim off scum and add salt and pepper to taste. Garnish with parsley. Add soy sauce and sesame oil as you like. *Amounts in the recipe are for IH donabe 2.5L. When using 1.2L, adjust the amounts to half. * Estimated time may differ depending on the cooking utensil you use, so please adjust according to your preference.